Weddings with receptions can be stressful to plan, let alone destination weddings! At Flower Mountain, wedding and reception inclusive packages are our specializations, being partnered with the Smokies' premier reception and event facility to provide our couples the best wedding experience. Unlike other wedding venues in our area who offer "stress-free" D.I.Y receptions—in which you would have to provide your own food, china, linens, tablecloths, silverware, wedding cake, grooms cake, DJ, etc. They believe that, "this is a great way to have a beautiful ceremony and a relaxed reception"—WHAT?! Seriously?? Come on, seriously?! A stress- free reception begins with your family and friends being able to enjoy attending your wedding, without sweating, stressing or lifting a finger concerning your wedding ceremony and reception details. For couples who are planning weddings on a budget, they often feel like planning and attending to every detail of their destination wedding is their only option because finding an affordable wedding venue is hard. However, at Flower Mountain Weddings & Receptions, our packages start at a very affordable price-point for those brides who are planning their destination wedding on a budget. Of course, if you plan on doing any decorating at your wedding yourself, you are more than welcome to do so. But if you ever need a helping hand at any time, one of our professional wedding venue staff will be right there to assist you and you won't be left feeling like you had a cheap destination wedding at a premium price. Many weddings on a budget feel that they are doomed to have less than satisfactory outdoor wedding venue and wedding reception hall facilities to choose from. In Gatlinburg and the Great Smoky Mountain area, this is definitely a major concern. Local catering and banquet halls leave a lot to be desired, providing inadequate wedding facilities. At Flower Mountain, though, we have both indoor and outdoor ceremony experience. We have a partnership with the Smokies' premier reception event center. They will help you with all the details for a fabulous reception experience! 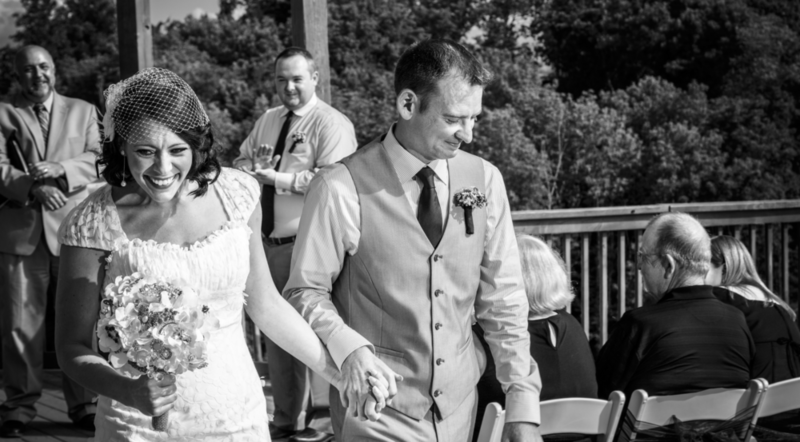 Many of our couples choose their outdoor ceremony on our wrap-around, covered porches. This option allows you to relax with friends and families in the beauty and privacy of our 25-acre wedding estate and breath-taking views of The Great Smoky Mountains. The hearth room is also used for indoor weddings and ceremonies, in case of inclement weather, or if you prefer the feel of a warm and intimate cabin in the mountains for your wedding ceremony. Aaron and I would like to thank you for such a wonderful wedding!! Our special day was simply perfect! Every detail was picture perfect down to the breathtaking location, decorations, flowers, wedding cake, and the delicious dinner at the reception! Our family and friends enjoyed every minute! We are overwhelmed with joy to have such great memories! We would also like to thank Minister Chad Driskell for blessing us with such a beautiful ceremony! ...and we let Casie and her staff use their creativity to plan our special day. They went above and beyond to make our day one that we will never forget. Needless to say we were blown away! I promise you will have the same experience we had. The staff at Flower Mountian Weddings is amazing!!! !